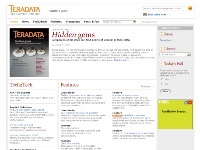 Details: Teradata magazine online. The magazine is a good source of information for the future of Teradata data warehousing, contains latest news, technical articles, viewpoints and case studies. It is a good place to learn teradata, both from the analytical and technical point of view.